Die ersten Screenshots trudeln ein. "If you want to face us, fine - but we will not hold back. Prepare to reap the whirlwind." Hat auch nix mit MWO zu tun, aber wie bitte...?!? At the 2012 Game Developers Choice Awards on Wednesday night, Bethesda's Skyrim won Game of the Year, while Portal 2, Bastion and others earned game industry honors. stopf' bekanntes Standard Gameplay und Standard Intro-Story zusammen mit Standard Vollpfosten-AI und 'ner Menge Flaws und absurder neuer Ideen in eine Generalüberholte Engine... und mach damit trotzdem Gewinn! It plays like MechWarrior 4 and looks like Crysis 2. I'm kind of tempted to end the preview right there because, if that description doesn't make Piranha Games' upcoming resurrection of the franchise a "must play," nothing else I say is likely to matter. On the off chance that you're still not convinced, maybe I should also mention it marks the series return to the PC as well as its entry into the free-to-play market. Still not convinced this is the giant robot combat game to watch in 2012? Then read on. 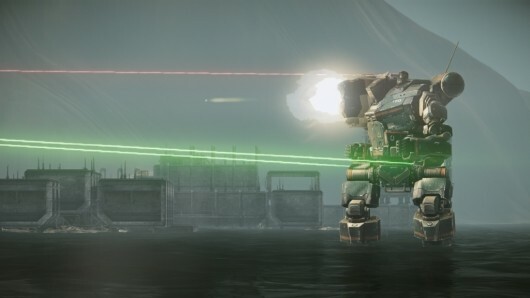 Piranha Games has been the rights holder to the MechWarrior brand since 2008, when it worked with FASA founder and Battletech producer Jordan Weisman, who had just recovered the franchise from Microsoft. The team's passion and reverence for the game is evident both in their attention to detail and their focus on what makes MechWarrior so appealing in the first place. When you first see the game, it's easy to be beguiled by the visuals. Using CryEngine 3, MechWarrior Online is breathtaking. The demo level is an idyllic sort of country scene, full of hills, trees and streams. It's not only highly detailed but thoroughly beautiful as well. As we tracked our mech across the level, we passed by postcard-perfect waterfalls, stomped our way across serene lakes and darted in an out of stands of trees. It made me even more anxious to see the team's treatment of the other iconic Battletech environments. Ice, desert, and city levels will all be available at launch. 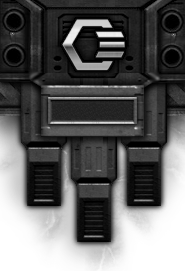 Once you get past the looks, you'll be able to appreciate the level of detail in the mechs themselves. Though the game includes a full heads-up display, the cockpit of each mech gives you all the information you need with regard to weapon and damage status, the location of nearby mechs and your current heat levels. The various panels and readouts all work in real time, which makes you feel like you're really piloting one of these massive machines. You can even use free look to get a closer view of all the components on the interior of your mech. You'll see them respond to damage as well, with sparks flying around as displays shutdown and steam rises from overheating. The mech we're piloting is a Hunchback, a 50-tonner that's slow but packs a big punch. Pulling the camera back, we can see it's equipped with two underarm laser cannons, another laser in the chest, and a shoulder-mounted autocannon. Back in the cockpit, the developers explain that each weapon fires from its specific location, so it's possible that an enemy behind a hill could have cover from the arm and chest lasers but not the higher mounted autocannon. What's particularly cool is that you can target the arms independently of your chest and shoulder mounted weapons, meaning you can take on two targets at the same time. Customizable weapon groupings and a full-featured mech lab allow you to customize your mech's loadout to be exactly what you need for any given role. 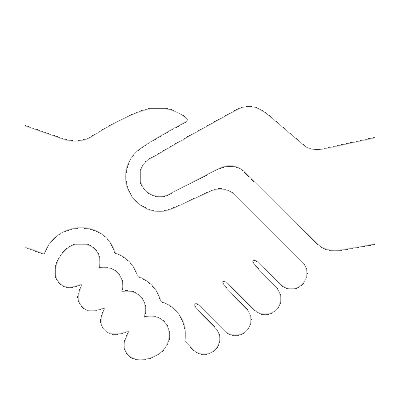 This idea of role is one of the main focal points for development. To discourage the entire community to gravitate just toward the largest and most powerful weapons platforms, the developers are including a number of rewards for more supportive play. In our demo, a lighter and faster Jenner discovered our Hunchback and after a couple of hit and run attacks, bounded off over the hills to relay our position to the rest of his lance mates. This non-assault type of play offers the same experience points you'd normally earn in combat. The Jenner, might for instance, merely be looking for targets for a slower Atlas who's waiting to ambush the Hunchback if he chases the Jenner down. Sure enough, that's basically what happens in the demo. After finally cornering and destroying the nimble Jenner, our Hunchback runs into the gigantic Atlas. Armed with a wide range of incredibly deadly weaponry, including lasers and more missiles than a small country, the Atlas pounds away at our mech, stripping away armor, weapons, an even an entire arm before our mech overheats and explodes. There's no single player component to MechWarrior Online; right now all play is online player-verus-player in matches with up to 12 mechs per side. The idea of having six different lances battle it out at once is definitely exciting, as are the development team's plans to create a persistent context for the battles via an Inner Sphere map where victories and defeats determine who owns what territory. We haven't had a decent MechWarrior game since 2002's Mercenaries. After Microsoft's MechAssault in 2002 and 2004 for the original Xbox, the franchise has been stagnant, at least as far as videogames are concerned. That makes Piranha Games' faithful and ambitious revitalization even more attractive. I'll definitely be keeping an eye on this one, and the more board-game inspired MechWarrior Tactics, in the months leading up to the summer release. Wuhahaha hört sich doch mal Spitze an. Maps dürften auch ganz schön gestaltet sein, oder ob das nur Euphorie ist? Naja, was immer man unter einem "full-featured mech lab" auch verstehen möchte. Möglicherweise meint er damit die verschiedenen Module, die man einbauen kann. Den Dev Blogs und Q&As zufolge soll es nicht möglich sein, etwas an Bewaffnung, Reaktor und Internen Struktur zu schrauben. Irgenwo wurde von Paul mal erwähnt, dass man die Panzerung verringern würden könne, um Tonnage freizumachen (um evtl Raum für Module zu schaffen?). Ich würde ertsmal abwarten und auf die Beta warten. The notion of strapping oneself into a massive battle robot chassis and duking it out with other 'Mechs appeals to the inner child in all of us (or it should), so it's hard not to feel a tingle of excitement when the makers of MechWarrior Online promise that we'll soon be able to do just that. We caught up with the Piranha Games crew at GDC to become one of the very first non-studio witnesses of MWO's in-game footage and to hear why this is a title that should be on all of our radars. The team is filled with huge fans of the MechWarrior and BattleTech franchises, so the devs were eager to construct a proper MechWarrior title when Piranha got ahold of the license this year. The studio seized upon the free-to-play model early on as the best way to draw in as many potential 'Mech pilots as possible. It also snagged the CryEngine 3 to provide the best possible graphical fidelity for its product. Unfortunately, it's going to be hard to categorize MWO as "massively," as its non-persistent arena maps will host up to only 24 players in 12v12 fights. Setting-wise, MechWarrior Online begins in 3049, but that date will keep tempo with the real-world calendar (so tomorrow it'll be March 8th, 3049, and so on). As events happen in the story according to the game's canon, the game will change to reflect that in real-time. Read on to hear what the devs had to say about two of the game's four pillars: mech warfare and role warfare. Mech warfare is Piranha's fancy term for utilizing the complex 'Mechs in combat. Every cockpit for every 'Mech is unique, as Piranha wants to make the player feel as if he or she is the actual pilot in the machine. The HUD is a vital part of the feedback that will help you control the vehicle, and the devs said that when you take damage, you'll even see instrument panels explode and spark. Lasers will carve lines of molten steel into enemies -- and it'll show -- and explosions will dent armor. 'Mechs range from the light 20-ton models to 100-ton beasts, with front and rear armor to protect the pilot. Weapons can be divided up into three groups, which is helpful when dividing between torso-based and arm based. Interestingly enough, your arms and torso can target different enemies at the same time. If your 'Mech takes too much damage in a fight, you'll have to take it to the shop and get it repaired before heading out again. This is one of the most significant advancements in the MechWarrior video game franchise. Previously, players would simply work their way up in weight classes; the heaviest 'Mech was always the best. However, Piranha wants all types of 'Mechs to be viable on this battlefield, so light 'Mechs are extremely useful in providing quick strikes, scouting the environment, and helping to assist with kills. Essentially, battle 'Mechs come in several different varieties, each with its own role. There are light, medium, heavy, and assult 'Mechs, and these can be adapted to perform in Scout, Striker, and Commander roles. The roles are roughly equivalent to MMO classes so that players can identify more easily with them. There is another type of warfare in the game that the team briefly mentioned: community warfare. It's in this sphere that you can join mercenary groups to try to take over sections of the world and control the meta-game. Unfortunately, Piranha wasn't quite ready to get into detail about that yet. We also asked about crafting, and the team said that there is a 'Mech lab that allows players to come up with custom variants of weapons and 'Mechs. While it doesn't look to be a proper MMO, considering that recent titles like World of Tanks have proven to be immensely popular, we'd be fools not to keep MechWarrior Online on our radar. The title is slated for a summer 2012 release. Neee, das is' aus meinem Photoshop-Portfolio für meine PGI-Berwerbung! Also da hol doch einer meinen LAM vom Himmel. Sieht ja sowas von verdammt gut aus. Da steigt die Vorfreude doch glatt ins unermessliche. A return of a sorely missed genre. Up until today all I'd seen of MechWarrior Online was teaser trailers, concept art and a series of developer blogs on the game's official site. Now, having seen it running, I think MechWarrior Online will change perceptions about what it means to be a free-to-play game. This isn't a cheap looking game aiming to cash-in on nostalgia built up by the MechWarrior franchise. This is a mech combat game that takes what we all loved about the old titles and builds upon it. 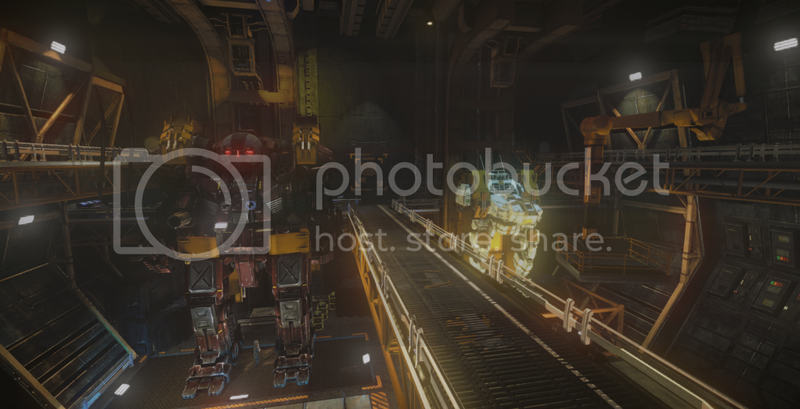 The biggest reason MechWarrior stands out as a free-to-play game is how good it already looks. Built using CryEngine 3, the team's love for the series shows with the care and effort put into painstakingly recreating the look of each mech from the Battletech universe. 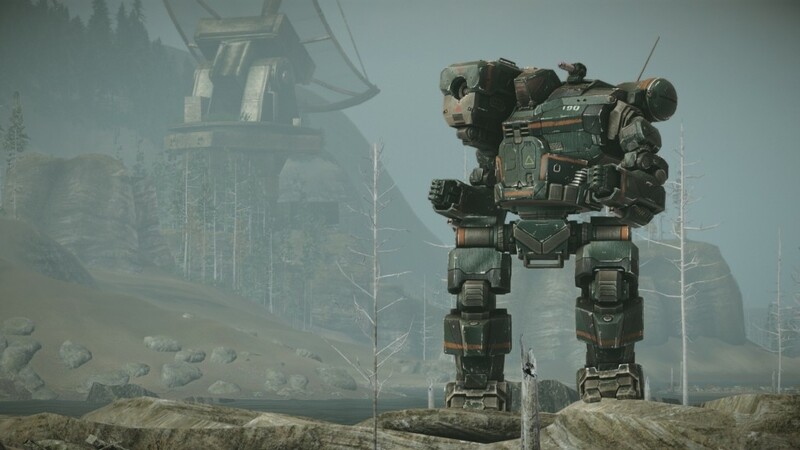 Iconic heavy mechs like the Titan are immediately recognizable, and look fantastic as they splash through rivers or pound the earth of the mountains. How a mech looks matters, too, because what you see is what you get. As fans have come to expect, every mech is extremely customizable, with adaptable weapon loadouts and accessories to suit different play styles. If you're fighting a Hunchback with an autocannon jutting out of its shoulder, you'll be able to tell just by looking at it. What's more, you can then target specific parts of that mech in order to blast away that troublesome limb and all its armaments. On the flip side this means that placing your weapons and accessories on specific parts of your body makes a huge difference. The reason for this is due to the fact that your arms can aim and fire independently of the rest of your mech. Previous mech games tended to make your entire upperbody pivot, firing all at the same place, and making your arms feel like static emplacements. 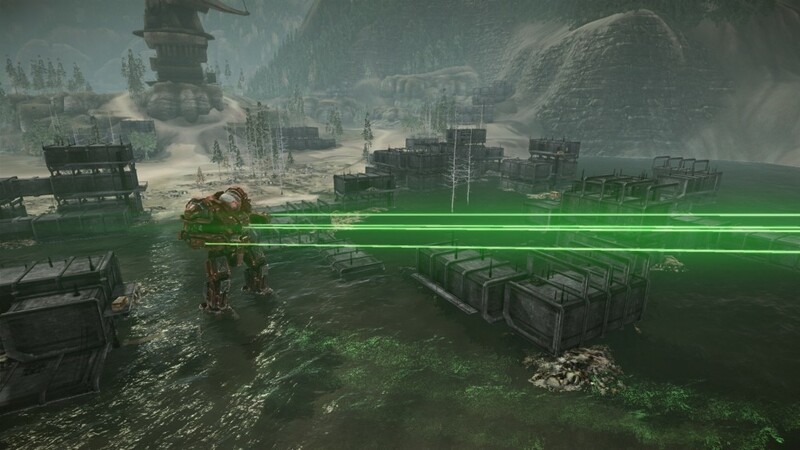 In MechWarrior Online you can fire your torso weaponry at one target, while independently aiming your arms and blasting away at another target, or even a specific joint on the same enemy. Ultimately the goal of a fight is to kill the other team (called a mercenary group), but your role can be as straightfoward as heavy weapons guy, to being the spotter or fast-moving scout. The challenge, then, is for developer Piranha Games to reward everyone for doing more than getting kills, something the team's been working hard on. At the end of the fight they want someone who spotted by monitoring radar and thermal imaging screens to feel like they contributed as much as the heaviest mech. How each player fights will potentially depend as much on the environment as it does their loadout. 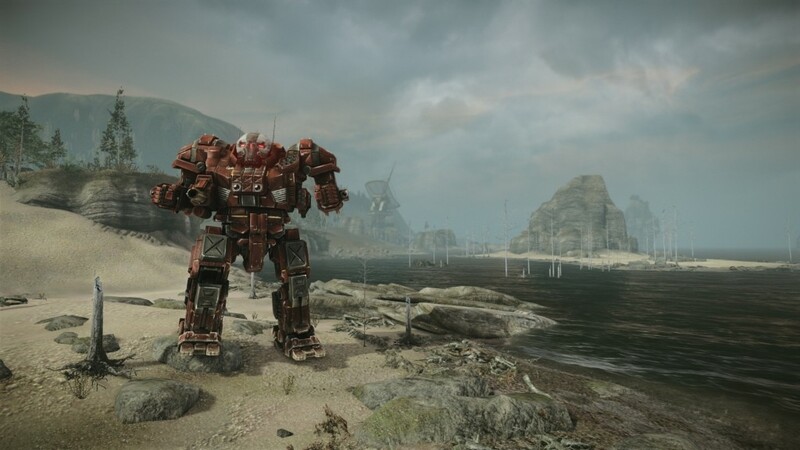 The Mechwarrior universe takes place on hundreds of worlds, meaning battles won't always take place in serene mountains with grass and trees. Fighting in a desert means less cover for mechs to hide behind, but also, due to the extreme heat in the environment, makes thermal imaging less efficient. The reverse of this are ice worlds, where your weapons will be slower to overheat, and you'll easily stand out to a good mech commander who's watching their scanners. Water will also cool your mech's heat level if you strategically place your heatsinks on your legs, and can make the difference if you're fighting on a world with many shallow bodies of water. MechWarrior Online will enter closed beta testing in the near future, with an open beta launch before year's end. Pirahna Games emphasizes that no one will be able to pay their way into power, and their microtransaction system will generally focus on giving players with less time and a bit more money additional gameplay options. Either way, whether you want to pay or not, this is one mech game everyone should try when it's available. Der Artikel verwendet dieselben bereits veröffentlichten Screenshots, daher verzichte ich mal darauf, die hier einzufügen. Schön ist das die open Beta noch vor Jahresende starten soll..... wobei das Spiel für diesen Sommer angekündigt wurde..... aber dies halte ich für realistischer. "Iconic heavy mechs like the Titan are immediately recognizable..."
"Ultimately the goal of a fight is to kill the other team (called a mercenary group)..."
(XBox360) obwohl es von Anfang an ein PC Exklusivtitel war. IGN waren immer schon mit viel Vorsicht zu genießen. I'm not really sure where they got "late 2012 beta" from. MechWarrior is coming back in a big way in 2012, with a pair of free-to-play online games: MechWarrior Online and MechWarrior Tactics. Infinite Game Publishing is bringing back MechWarrior in a big way for 2012 with two sharp-looking online titles, MechWarrior Online from Piranha Games and MechWarrior Tactics from Roadhouse Interactive and Acronym Games. They’re both free-to-play titles that offer vastly different experiences: the former is an action-focused first-person mech combat game that’s been built on CryEngine 3 and the latter is a turn-based strategy game playable in your browser using the Unity plug-in. I got a chance to see both of these games in action as the doors officially opened on GDC 2012 earlier today. 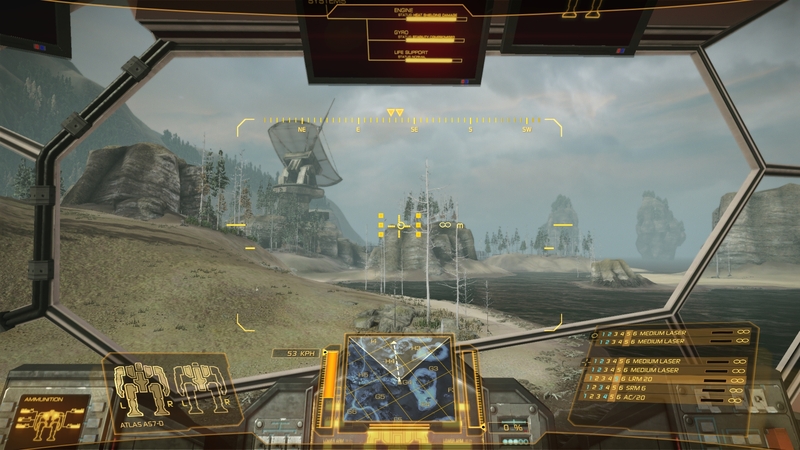 The aim in MechWarrior Online is to put players directly in the pilot’s seat of their own, highly customized mech. At the core you’re looking at a 12 versus 12 multiplayer experience, with each team broken into four mech squads, known as Lances in the MechWarrior parlance. A standard 12v12 match in MechWarrior Online is a no-respawn affair; if your mech is destroyed, your time in the match is over. These mechs are persistent too; whether your is destroyed or simply damaged in a match, you’ll need to make sure it’s repaired once the match is over. Other modes are possible in addition to the core 12v12. Drop Ship is one example, allowing players to bring three mechs into battle; if what you’re piloting is destroyed, the next mech in your lineup gets dropped into the battle. CryEngine 3 renders some impressive visuals for this free-to-play game. The sample battle I got to see played out against the backdrop of rolling green hills and skyscraping rock outcroppings. Players can expect to see other environments as well: icy regions, deserts, city centers and the like. More importantly, the weather conditions in a given region can have an impact on gameplay. Your overheat-prone mech is going to be able to fire its weapons more frequently in a snowy environment than it will in warmer climates. Much attention has been put into the look of the mechs themselves, with each type having a unique design and feel. Not just from the outside either. Each mech cockpit is filled with all manner of displays and readouts, and they all update in real-time with relevant information. Much of this information is also provided by the HUD, but the in-cockpit readouts offer more detail; the tradeoff is that you’ll need to free-look around the cockpit to take them all in. The level of detail extends to combat as well. As your own mech takes damage, screens will flicker, sparks will spurt out from panels, waves of heat will wash through the cockpit and chunks of metal will break off on the outside. You’ll see the effects of your attacks on other mechs as well, with limbs breaking off under sustained fire. This isn’t just a cosmetic thing either; shoot the the weapon-equipped arm off of an enemy mech, and that weapon will effectively be put out of commission. The team is putting a big emphasis in the game on role warfare. You’ll earn experience for taking a heavy assault chassis into the field and scoring kills of course, but scouting around and marking potential threats or softening up distant foes in more of a support role are equally viable sources of XP. You’ll ultimately spend this XP on improving both your mech and your pilot in various ways. For those who wish to dive deeper, Piranha is planning some elaborate community features to give players the feel that they’re fighting in a persistent future war. The calendar that we use today is still in place in the game’s 3048 setting, so there’s a sense of everything in the ongoing war unfolding in real time. 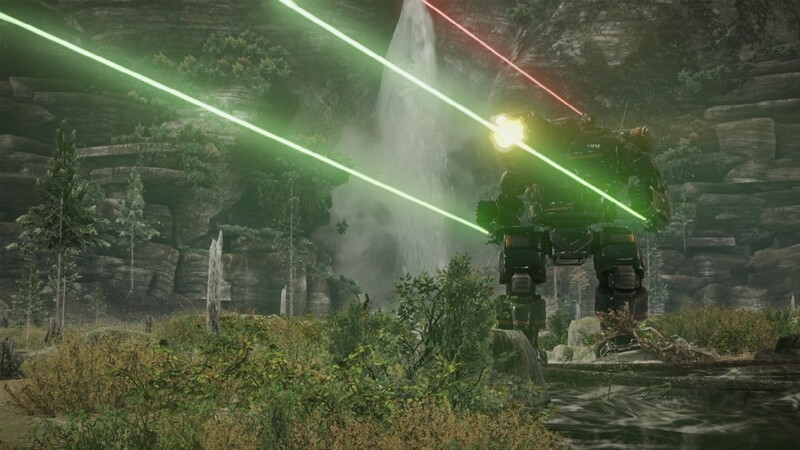 There’s no official set of required and recommended specs yet for MechWarrior Online, though Piranha acknowledges that CryEngine 3 scales well. Expect the open beta to launch this summer. Also coming later this year is MechWarrior Tactics, the product of a collaboration between Roadhouse Interactive and Acronym Games. While the focus can still be boiled down to “giant robots pounding the crap out of one another with large guns,” the moment-to-moment play is slowed down to tactical turn-based strategy that plays out in a variety of environments on a hex-based grid. It’s a bit like a tabletop strategy game, only it’s playable in any browser equipped with the Unity player plug-in. The self-stated goal with Tactics for the two studios is to “bring intensity to the turn-based genre” by mixing cinematic elements in alongside the turn-based, stats-focused play. Multiplayer is asynchronous, so you can have multiple confrontations. There’s no limit to how many battles you can have going at any one time. You’ll typically be watching the action unfold from an isometric perspective. There’s a notable exception to this, as you can see once all orders have been handed out during the game’s Attack Phase. The camera switches to a dynamic, cinematic perspective as the hex grid disappears and the mechs let loose with their varies weapons, as orders dictate. The actual play should be immediately familiar to any fan of tactical turn-based strategy games. You’ll move your mechs around on the map grid, taking care to be mindful of the environments around you and potentially advantageous/disadvantages positions. Trees, for example, provide good cover, while elevated positions — some of which are only accessible to smaller mechs with jump capabilities — help players extend how much of the map is visible. Once all move orders have been issued, the Attack Phase begins. Selecting one of your mechs and clicking on an enemy target brings up two windows: one informing you of how damaged the enemy is and the other listing the various weapons you’re able to bring to bear on that enemy. While there’s an elaborate numbers game going on behind the scenes, players can simply look at the list of weapons and how they’re color-coded to get a sense of how effective an attack will be against the chosen target. The color coding, in descending order, goes from green to yellow to orange to red. Of course, combat is only a portion of the play in Tactics. Gamers who enjoy obsessing over building giant robots of death and destruction will be able to get their fill in the Mech Bay. Parts can be interchanged freely between chassis’ here. You might want to try kitting out your heavy Atlas mech in more of a ground support role, since its slow advance makes it ideal for pounding enemy forces with artillery. You could instead opt to load it down with lasers and other shorter-range weapons, relying on its thick armor to soak up enemy fire on the front lines. Your assortment of customization options grows as you collect STACs, shorthand for Surplus Tech/Armament Container. These are essentially booster packs; you can pick them up while playing online in multiplayer, offline in a bot-filled training mode (though with much less effective gear) and in the game’s microtransaction-based store. STACs contain everything from pilots and chassis’ to heatsinks, armor, and, of course, weapons. The idea is to constantly push players to be toying with new builds for their mechs, experimenting to find more effective combinations for completing various objectives. You can also spend real money on customizable elements like details to distinguish your mechs from others on the battlefield. Separate from all of this is a ranking system. It’s less like the dangling carrots of the Call of Duty games and more like the community elements of Gears of War and Halo. Earning ranks in MechWarrior Tactics has zero effect on the gameplay; it’s more meant to be used as a measure of how players compare with one another. There’s no date more specific that 2012 for Tactics right now, but it seems to be coming along well. The play probably isn’t for all players, but it’s certainly a good-looking browser-based game and it really seems to nail the core goal of bringing tabletop gaming to life in a new and interesting way. Between this and MechWarrior Online, 2012 is definitely shaping up to be a good year for fans of giant fighting robots. Könnscht desch vielleisch eimol Schtiggy moche? Hm, lässt zumindest mal auf was neues hoffen, aber würde die Erwartungen nicht zu hoch setzen. Während meiner Inet-Abstinenz habe ich mal MW2, MW2mercs, MW3 und MW3 pirates moon mal wieder zum laufen gebracht und danach MW4mercs. Definitiv mehr Spass an den alten Spielen gehabt. Dieses auf die-Grafik-fixieren geht mir irgendwie ab, das funktionierende Gameplay ist meinem Spielspass immernoch wichtiger. Natürlich ist es immer gut, wenn das Spiel auch Klasse aussieht, aber die Prioritäten sind leider meist verschoben. Ich werde den Tag meines ToP beim damaligen Clan nie vergessen. 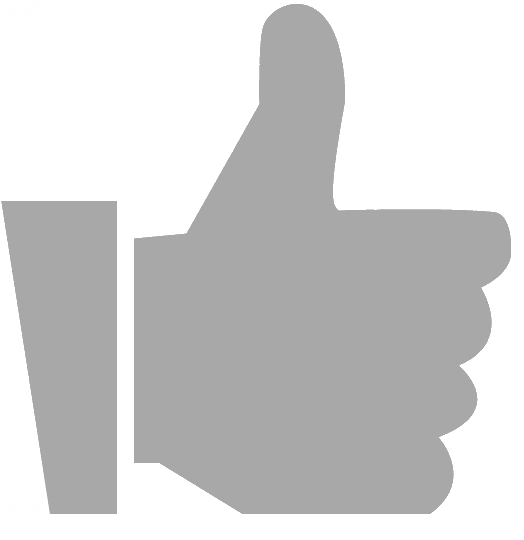 Monate vorher MW3 in Singleplayer auf hard gespielt, im MP versucht noch besser zu werden. Als es dann soweit war, mit schweissnassen Händen Maus und Joystick gegriffen und gewusst jetzt oder nie. "Wenn LSR ne 180grad Wendung machen können, ist was falsch"
naja erstmal abwarten. Schade ist natürlich das sie auf den Solopart verzichten. Denk mal es wird eine Mischung aus MW4, MW3, MPBT3025 mit einem Schuss World of Tanks. Entweder es wird was richtig leckeres oder etwas was nur hochschwangere Geniesbar finden. Aber so oder so eine schöne Grafik schadet erstmal nicht. Verdammte Hacke, wenn ich diesen Mist hier nochmal angezeigt bekomme, kriege ich so allmählich das KOTZEN!!!! 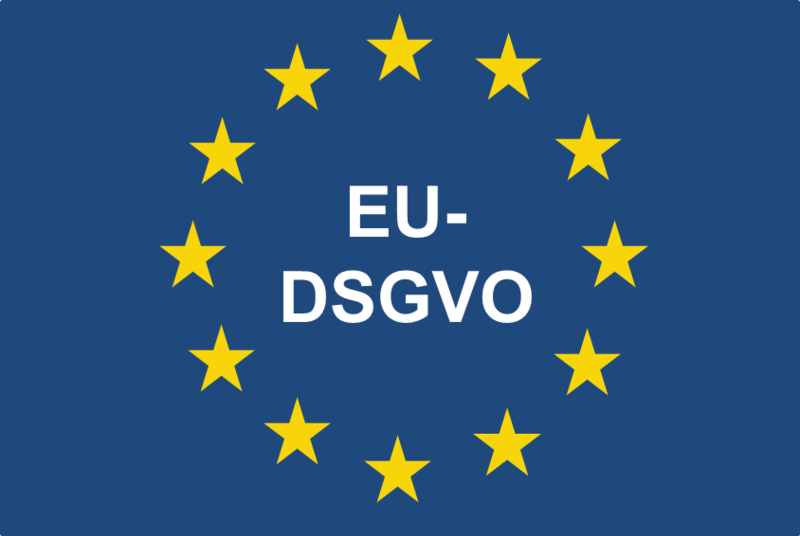 Und das kommt NICHT von meinen Browsereinstellungen, der Jugenschutz ist komplett AUS!! Es macht langsam keinen Spaß mehr, hier irgendwas zu posten! The Security System stopped an attack of the System. We've written the user data in a log system. Wir haben diesen Vorfall protokolliert. @Meldric: Wie wär's denn mal, wenn du dieses Drecks BS-Fusion runterschmeißen würdest, so es möglich ist. Oder komplett ausschaltest! Es ist offensichtlich nicht in der Lage, Spam vom allgemeinen Sprachgebrauch zu unterscheiden?!? Nun, gottseidank ist Piranha Games nicht Winzigweich. Publisher IGP lässt den Entwicklern von MWO wohl freie Hand und fummelt denen nicht dazwischen. Ich bin überzeugt, dass, wenn FASA Interactive damals die Freiheit gehabt hätte, zu machen was sie wollen, MW4 nicht die Mißgeburt geworden wäre, die durchs Winzigweichs massiven Einfluß mit Blick auf eine etwas andere Zielgruppe und $$$ am Ende herauskam. Sicher wollen die Jungs von PGI auch Geld verdienen und machen das nicht aus wohltätigen Gründen. Das Gute ist, dass der Großteil der Entwickler selber eingefleischte MechWarrior-Fans sind, die vom allerersten MechWarrior bis MW4 alle Teile gezockt haben und MW2 und MW3 als die besseren Teile befinden. MechWarrior 2-4 waren allesamt Solospiele mit angeflanschtem Multiplayerpart als "Goodie" (bei MW2 wurde "NetMech" sogar erst hinterhergeschoben). Auf kurz oder lang werden solche Spiele wohl eher aussterben, zumindest, was den PC angeht. Dessen Marktanteil ist ja im Vergleich zu den Konsolen sowieso eher Mau. Nach der Fasa-Schliessung kam Smith&Tinker, aber ausser Verscherbeln haben die ja auch nichts mehr mit der Lizenz angefangen, obwohl Weissman dabei war/ist. Das es keinen (zumindest kleinen) Solo-Part geben soll, wundert mich auch. Wenn man die Engine sowie Mechanik zusammen hat, sollte doch zumindest ein Solo-Tutorial kein Prob sein. Bin halt erstmal Schwarzseher, lasse mich aber gerne anstecken, wenn das was wird. Andere Sache: Habe in letzter Zeit oft von World of Tanks gehört, wird hier ja auch ein paarmal erwähnt. Klingt erstmal nicht schlecht. Gibts hier ein paar Spieler, vielleicht sogar ein Topic? die Vernichtung alles schwachen die Konsequenz. Hm, seltsam! Ich habe es mir durch den Link problemlos herunterladen können. Ich Ward mal sagen dei Technik isch kaputt! Naja, ist so nicht ganz richtig mit der Lizenz, die hat Winzigweich schon damals zu Zeiten von MW4 exklusiv in der Tasche gehabt. Und die haben dann ausser Konsoleros mit einem 3rd-Person-MechShooter zu ärgern 10 Jahre lang nix damit gemacht! Smith&Tinker hat sich in 2009 die Lizenz nicht etwa wieder zurückgeholt, All-Things-MechWarrior ist (leider) immer noch in den Händen von M$. Was unter anderem dazu geführt hat, dass sich der Reboot von MechWarrior etwas anders entwickelt hat, als geplant, da M$ eine Konsolenversion für die PS3 ablehnte. Aber das steht alles im Dev Blog 0. Zum "Tutorial": steht noch nirgendwo, dass es sowas nicht geben wird. Nur dass eine Solo-Kampagne wohl eher net zu finden sein wird! Was WoT betrifft, da Entwickler Wargaming.net die doofe Angewohnheit hat, das Spiel kaputtzupatchen, hat der Spieltrieb dies betreffend etwas nachgelassen. Die meisten zoggen jetzt eher Star Wars: The Old Republic. Isch net, ich schieb' den Burschen von EA keinen Cent in den Hintern. Ist F2P, kost' nix, ausser Nerven! naja WoT wird schon noch von einigen gespielt. Nicht mehr so viel wie am Anfang aber doch eigendlich noch fast jeden Abend wer da. Und wenn wer fragt dann auch ganz sicher . Patch 7.2. hört sich erstmal nicht schlecht an. Mal sehen. naja WoT wird schon noch von einigen gespielt. Nicht mehr so viel wie am Anfang aber doch eigendlich noch fast jeden Abend wer da. Und wenn wer fragt dann auch ganz sicher ;). Patch 7.2. hört sich erstmal nicht schlecht an. Mal sehen. Verzähl nix! Jedesmal, wenn ich guck', hängt alles bei SWToR 'rum. Verdammte EA-Unterstütza!! Schande über euch! Der Spamschutz verhindert leider, dass der Text hier gepostet werden kann! Jetzt weiß ich auch, warum das Zeuch BS-Fusion heisst! Naja sonst hättest du ja auch abschreiben können, hätte bloss länger gedauert. zu streben, zu suchen, zu finden und nicht aufzugeben. rights and within a few weeks, we signed a deal. Zum single/tutorial: Tja, wär schon nett, wenn wenigstens so eine mini-sp/tut dabei wäre, obwohl ich natürlich auch sofort in einen mp-mech hüpfen werde. Dipping your mechs’ legs into a river would dissipate heat, but only if you’d actually installed heat sinks in your mech’s legs. Nur eine Kleinigkeit, aber da denkt jemand nach! WIRKLICH freie Tasten/Achsen Belegung ist auch so ein Ding, ich hoffe mal, das das auch einfliesst. MW3 habe ich mit Maus UND Joystick gleichzeitig gespielt, war bei MW4 nicht mehr möglich. Naja, werde mir mal den blog durchlesen und mich danach an die Seite hängen, wird ja vielleicht dochwas. rights and within a few weeks, we signed a deal..
Hm, Okay, dann stand es wohl eher in derem Forum oder in einem der Artikel über MWO. Fakt ist, Smith&Tinker haben die Lizenz für MechWarrior von M$ gekauft, um den Reboot von MechWarrior als Singleplayerkampagne mit eingebautem Multiplayer von PGI machen zu lassen. Da sich Winzigweich aber gegen eine PS3 Konsolenversion aber auch sowas von komplett sperrte, fand sich auch kein Publisher, der bereit war, ein derartiges Projekt zu finanzieren. Weil Russ und Bryan das aber unbedingt machen wollten, haben sie dann Jordan Weisman angehauen, ob der ihnen die MechWarrior-Lizenz nicht für ein MMO abtritt, weil sie sich nur mit einer direkten Kontrolle über die IP da dranwagen wollten. MechWarrior is a trade-mark of Microsoft Corporation in the United States and other jurisdictions and is used under licence. Microsoft besitzt seit MW3 die MechWarrior-Lizenz, und wie wir M$ kennen, werden die die auf ewig in ihren Klauen behalten und nur gegen harte Knete rausrücken. Bei WoT hast auch kein Tut, da wirst einfach ins kalte Wasser geschmissen. Ich denke aber mal schon, dass es aufgrund der Komplexität der Steuerung ein Tutorial geben wird. Da ich eine KI dafür zu aufwendig halte, wirds wohl eher auf Zielscheibenschießen und grundlegende Steuerung hinauslaufen. DASS sich die Jungs von Piranha wirklich Gedanken machen, kann man schon daran sehen, wie sie mit der Community kommunizieren und auf Vorschläge und Fragen antworten. Ein Großteil der Jungs sind MechWarrior-Fans durch und durch. Von der Chefetage über den Designer bis zum Programmierer. Und welches Unternehmen würde trotzdem noch an einem Projekt stur festhalten, wenn die großen Produzenten lächelnd ablehnen? Ist wie bei Star Wars, wollte am Anfang auch keiner finanzieren, aber als der Erfolg die dann dumm aussehen ließ, wurden fleißig die eigenen Klone ins Kino geschmissen! Ach ja, noch was: ich bin kein ObKhan mehr, nur noch maD, genau wie du! Bis dahin: "Wann wird's mal wieder richtig SOMMER..."
MechWarrior Online GDC 2012 Preview -- World of MechWarrior? If you crossed Darth Vader with a giant mechanized linebacker, you might very well end up with the Atlas BattleMech. I gazed at its intimidating glory as it marched over a ridge and toward my direction, while I was in first-person view no less. This all-offensive mech made for a fine ambassador to this ambitious installment to the MechWarrior franchise, MechWarrior Online. My most recent encounter with it was during a hands-off demo at GDC as it’s one of the many mechs in the upcoming game. Franchise continuity unsurprisingly centers around the familiar mechs like the Atlas and there’s a solid, recognizable roster that will please the fans in MechWarrior Online. I also had a chance to see the scout class Jenner mech in action. Each mech type has their role; while the Jenner might not have the armaments and offensive versatility of the Atlas, it makes up for that by being one of the fastest mechs in the game. You pretty much have to be if you’re a scout. The Jenner in this demo was making a break for it so it could warn its team members where the person was and relay information to the battle grid. I witnessed this from the cockpit of a 50-ton Hunchback, another staple mech to the franchise. When the Hunchback pilot from Piranha Games wasn’t busy trying to gun down the elusive Jenner, he showed off much of the interior of the Hunchback’s cockpit. With the first-person perspective, you’re able to see the hands and feet of the character you’re controlling. As the Piranha spokesman put it, “We didn’t want you to feel like you’re playing as a mech. 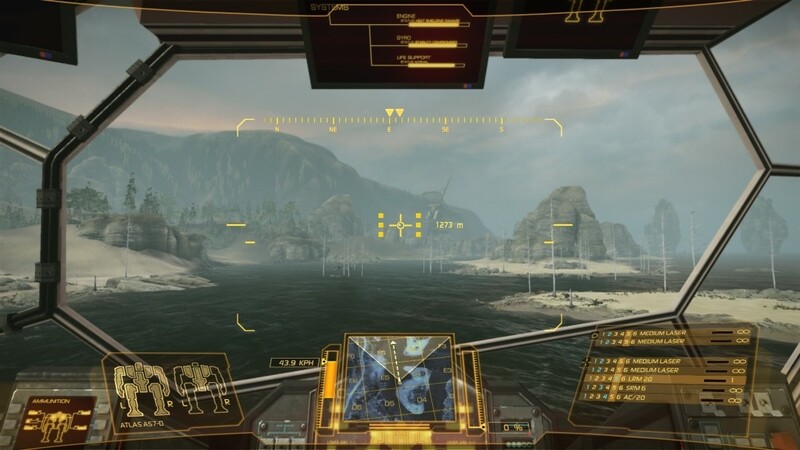 We wanted you to feel like a pilot controlling a mech.” As if competing with the likes of Steel Battalion or a jumbo jet cockpit panel, every indicator in a MechWarrior Online mech will serve a purpose. Everything from heat to damage to ammo count will be shown. Don’t be surprised if a couple screens go out if your mech takes a lot of hits. This is where the best gaming multitaskers will get a leg up, particularly with situational awareness. This emphasis on multitasking is compounded by the offensive tools one has in mechs like the Hunchback or the Atlas. This was demonstrated when one beam weapon was firing down the center of the screen while another weapon was fired using an independently movable reticule. You can imagine the convenience of assaulting a mech in the distance without needing to rotate your torso and center the target. These kinds of options are not available to armless mechs like the Jenner, but MechWarrior Online is not about a traditional arms race where your primary objective is to keep getting bigger and better mechs. All the mechs have their strengths and value to keep them useful indefinitely. You might lose a Jenner several minutes into a match, but it certainly wouldn’t be a wasted sortie since actions like damaging an enemy and sending valuable recon will earn you experience. Productive playing will reward you with the in-game currency on top of the experience points. XP can be spent on the mech resulting in unlocked ‘efficiency tiers.’ That then results in pilot skill points which then can be spent on the pilot’s skill tree. Similiar to the recently announced FPS WarFace, MechWarrior Online will also be a free-to-play PC title powered by Crytek's CryEngine 3. This highly capable engine has allowed the developers to give the game an impressive level of polish and detail. The forest environment I saw certainly had a staggering number of trees, but the environments go beyond just mere eye-candy. 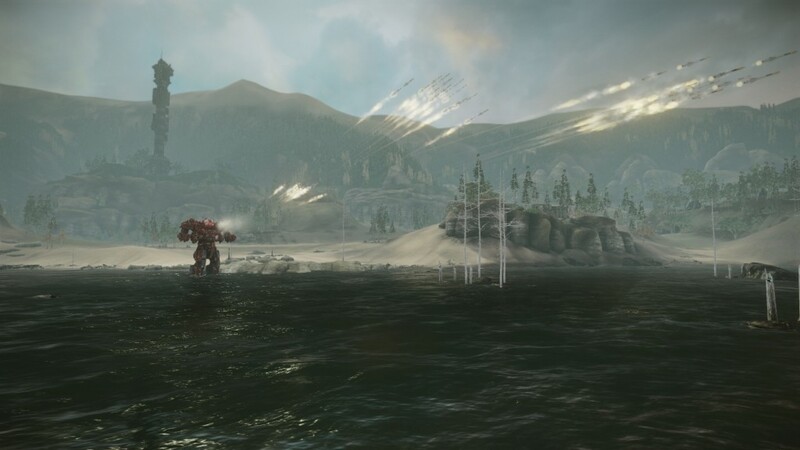 For instance, an observant gamer piloting a mech with heat sinks in its feet can actually regulate its temperature by walking into shallow water. Other announced environments include ice, desert, and urban landscapes. While past MechWarrior games have had online play, it was never done it on the scale that MechWarrior Online aspires to. We’re talking about a persistent game world; none of this asynchronous multiplayer that’s all the rage these days. That means if you’re a longtime MechWarrior fan, be ready to invest a lot of time with your team because territories and planets can change hands quickly and often. Ow, um es mal nochmal zu sagen: Ich glaubs erst wenn ich es sehe. Andererseits, mal nach langer Zeit ein wirklich gutes Mechgame zu kriegen, wär schon nett. Mir geht's da ähnlich wie dir. Aufgrund der Erfahrungen mit MW4 bin ich hin- und hergerissen zwischen hellauf begeistert und radikal skeptisch. MW4 hab ich auch schon mal wieder ausprobiert und auch MW3. Letzteres bekomme ich zwar dank den Jungs von mech3.org unter Win 7 wieder zum Laufen, habe aber wegen meiner ATI GraKa ziemlich mit Grafik-Artefakten zu kämpfen. ScoutAtlas?!? Bist du jetzt unter die Lyraner gegangen?!? Nee, ich würd mal sagen, als Scout taucht der Atlas weniger. Langsam und nicht sprungfähig. Da setze ich lieber auf den Jenner, schnell, sprungfähig, Gegnerpostition weitergeben und wech. Auch wenn der sowas von hässlich ist! Er ist gut gepanzert und schafft es sich zurück zu den eigenen Linien. Dazu kann man durch die schiere Grösse alles gut überblicken und schlussendlich kann er sich auch noch wehren und gegnerische Scoutlanzen im Alleingang zerlegen. Was willst du mehr? Wie sagte doch Duncan Fisher: Geschwindigkeit ist schön und gut im echten Leben aber wenn ich Gegner im Fadenkreuz habe, möchte ich sie möglichst schnell wegblasen können. genau das sind meine Gedanken aber das Video macht schon Lust auf mehr. Ums nochmal zu wiederholen: es sieht so aus, als ob die sich wirklich Gedanken machen. naja wir werden es sehn, wir werden es fühlen wenn wir es zocken. naja um ehlich zu sein ich fand auch die mw 4 teile alle nicht schlecht, immerhin warens die einziegen mw titel die es zum zocken gab, und sein wir mal ehrlich MW, egal welche teile, waren schon immer shooter und keine sims, und die 4er teile halt mit sachen drin um es actionlastiger zu machen. aus Ordnung und Unvorhersehbarkeit" (Clausewitz). "Nur das Einfache hat Erfolg." Du meinst, nur ein Assault bietet ein Cockpit, aus dem Biggie nach dem Gefecht ohne Benutzung eines Schuhlöffels auch wieder bequem aussteigen kann?! Nee, mal im ernst. Sicher könnte man auch einen Atlas als Scoutmech verwenden, nur ob das auch sinnvoll wäre, ist aufgrund seiner geringen Höchstgeschwindigkeit recht zweifelhaft. Die Hauptaufgabe eines Scouts ist, die Gegnerischen Kräfte aufzuspüren, am besten, bevor deren Scouts die Eigenen aufzuspüren vermögen! 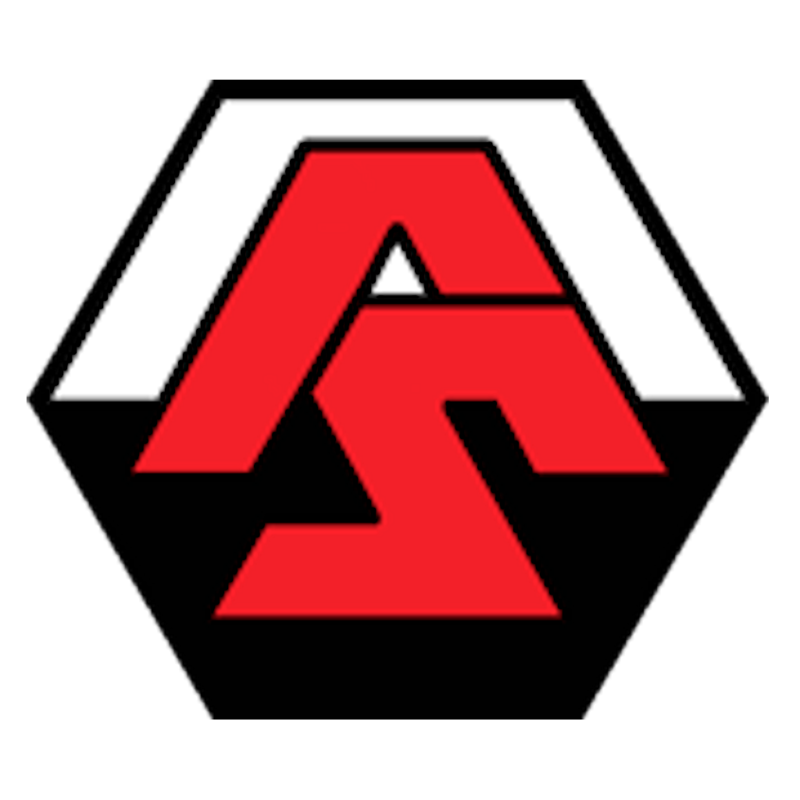 Da bringt es wenig, wenn die gegnerischen Scouts schon die eigenen Truppen aufgedeckt haben, während die Atlas-Scoutlanze immer noch auf der Suche nach deren durch's Gelände eiert! Na gut, vielleicht nicht grad ein Atlas, aber ein etwas stärkeren Mech in die Scoutlanze zu intregieren wäre vielleicht schon nett, wie z.B. mein geliebten Kesselbrut. Das festlegen auf Rollen hat ja imho auch Nachteile. Da ja wohl eh no respawn gespielt wird (was ich doch hoffe) wäre ein Scout in Verbindung mit einem schlagkräftigen Mech eine gute Taktik, um die/den gegnerischen Scout auszuschalten. das mit dem no respawn ist ja nicht ganz richtig wenn ich das englische richtig verstanden habe. Es gibt den Modus mit nur einem Mech und no respawn und den wo jeder noch 3 Mechs droppen kann wenn ich das recht verstanden habe. Bevorzuge dann aber auch den no respawn wie in WoT. MW4 war im Single noch OK aber imho im Multi sehr schlecht ausbalanciert. Einige Mods haben ja wohl einiges verbessert aber halt ein paar wichtige Sachen nicht. Hab jetzt keine Lust das nochmal aufzuzählen. MPBT 3025 fand ich zB sehr gut umgesetzt. Besonders das Sichtsystem und die kritischen Treffer. Keine Ahnung ob es das auch mit grösseren Mechs gehalten hätte. Zu mehr als den mittelschweren hab ich es da nicht gebracht. Blöde Beta 3-4 mal wieder bei Null anfangen . Stimme dir da zu, zu einem schnellen und wendigen Medium oder auch Heavy wäre nix gegen einzuwenden. Die Assaults sind aber zu langsam und behäbig, als dass sie effektiv zu einem Scout taugen würden. Das mit den Rollen darf man nicht falsch verstehen. Die Jungs von Piranha wollen die Spieler da keinesfalls auf irgendwelche Rollen festnageln, du kannst in deine Mechs die Module vollkommen frei einbauen. Sicher kann ich einen Assault komplett mit ScoutModulen vollstopfen und einen Jenner mit Assault/Defense. 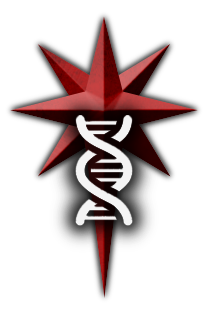 Ich darf mich aber hinterher nicht beschweren, wenn ich mit dieser Konstellation weniger effektiv bin, als wenn ich's andersherum verbaut hätte! Das Rollensystem unterstützt die Lights und Mediums, die in anderen MW-Titeln eben nicht so erfolgreich und damit auch nicht so gefragt waren. Ich finde die Lösung, die Piranha mit dem Role Warfare eingeführt hat, recht gut. Somit haben Lights und Mediums auch ihre Daseinsberechtigung, und es läuft nicht wie früher auf All-Out-Assault hinaus. In Verbindung mit dem Line of Sight/Detection-System (LOSD) wird es ein Light viel einfacher haben, den sich verbergenden Gegner schnell wiederzufinden dessen Position weiterzugeben, und sich dann auch wieder ebenso schnell vom Acker machen zu können. Na toll dann will ich aber mir zumindest meinen Assaultcommando bauen, der nimmt es dann alleine mit ner ganzen Kompanie auf! Assaultcommando?!? Ich dachte, du trinkst nich'! Biggie, schaut so aus, als wär der Kleine heut' bei dir in die Bowle geplumst! Anm: Bei 04:27 min. wird ganz nebenbei eine "Closed Beta" erwähnt, die in schon sehr bald eröffnet werden würde. Interssant an diesem ist die Bemerkung, dass die Friends and Family Closed Beta nächsten Monat, also im April, starten soll (02:53 min.). Zusätzlich gibt's einen ersten Einblick in MechWarrior Tactics ab 03:02 min.